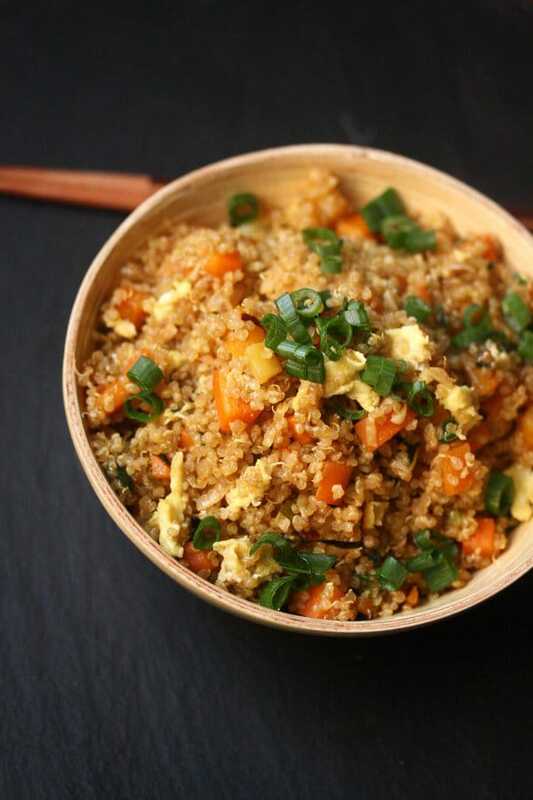 This Quinoa Fried Veggie Rice makes a great side or an easy and delicious vegetarian meal. The thing I like most about being in Florida is that it starts to feel like spring so early in the year. While much of the rest of the country is still dealing with snow, we are contemplating beach trips and worrying about if we go will the baby get sunburned. The warmer temperatures never fail to make me excited. I find myself wanting to be outside near constantly. I also find myself ready to lighten up my diet and simplify my cooking. 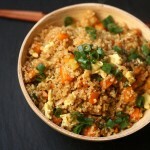 Recipes like this Easy Quinoa Fried Rice from Phoebe at Feed Me Phoebe are perfect for this time of year. Still cozy enough to be considered comfort food for the occasional cooler night. Yet veggie packed and perfect for getting you in the mood for spring. Really, this is the kind of dish that works regardless of the weather. Thanks Phoebe for sharing a great recipe with us! 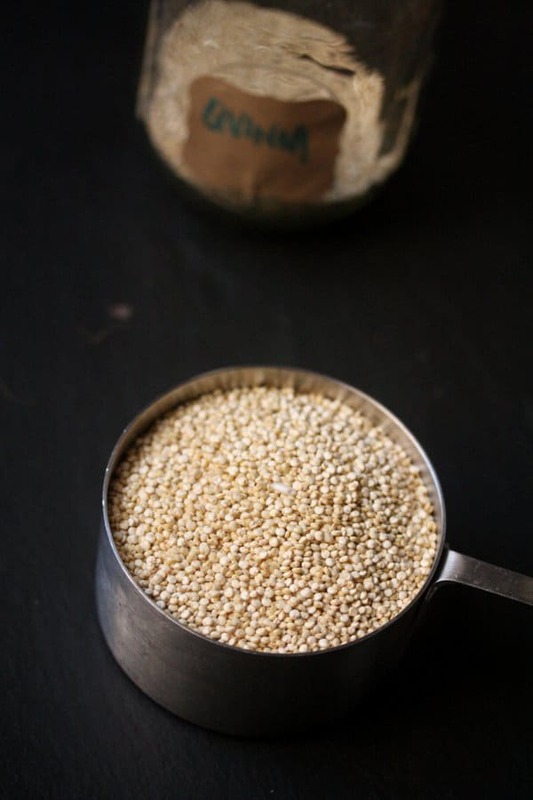 In a medium lidded saucepan, combine the quinoa and water and bring to a boil. Cover, turn the heat to low and simmer for 15 minutes, until the quinoa is al dente. Uncover and remove from the heat. Meanwhile, heat 2 tablespoons oil in a large wok or nonstick skillet. 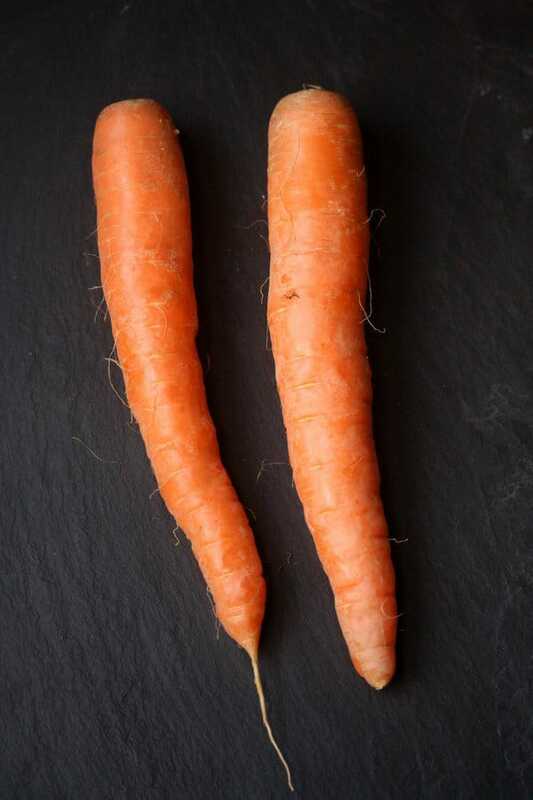 Saute the carrots, shallot, and white scallions over high heat until soft and beginning to brown, about 6 minutes. Season with salt. Add the garlic, ginger, and green scallions and stir fry until fragrant, another 2 minutes. 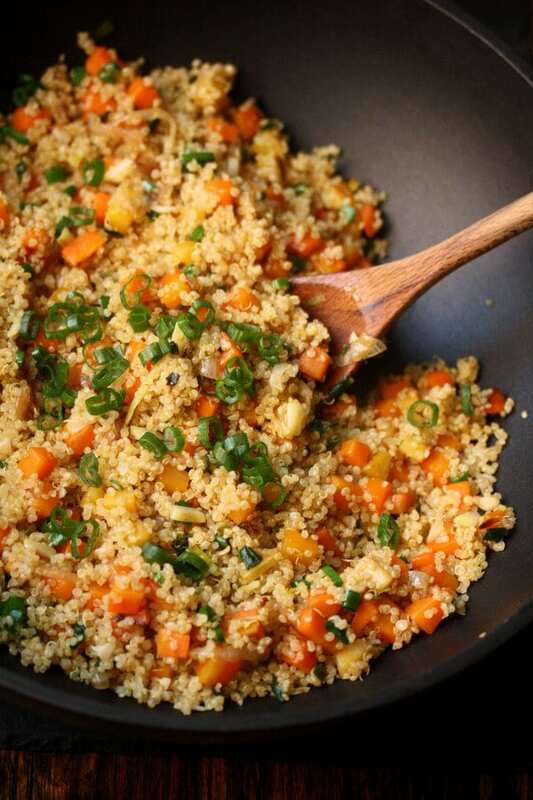 Fold in the quinoa and stir fry until well-coated in the vegetable mixture and beginning to toast, 3 minutes. Stir in the soy sauce, sesame oil, and sriracha. Push the quinoa to the side of the pan to create a well. Pour the eggs into the well and cook, stirring gently, until nearly set. Toss the fried rice with the eggs. Transfer the quinoa to bowls and serve right away. Phoebe Lapine is a 28 –year-old cookbook author, private chef, culinary instructor, blogger and caterer, born and raised in New York City, where she continues to live and eat. She documents her healthy comfort food, gluten-free finds, and snap shots of her professional cooking world on her award winning blog, Feed Me Phoebe. I absolutely love anything with fried quinoa.